The finished surface of a metal coil can be scratched and damaged at any point of the coil manufacturing process. 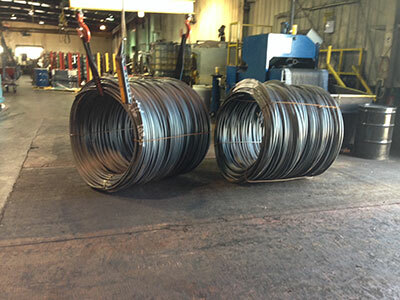 Protect your steel, aluminum, copper coil and your processing plant’s floor with our recycled non-slip steel coil pads. These heavy duty mats are made with recycled conveyor belts and can withstand extreme weights. Our steel coil floor pads can easily be moved through out your plant as needed. All our coil storage pads are cut resistant, oil resistant and will protect any metallic coils, especially your softer metals like aluminum and copper. We have a variety of widths available and our material can easily be cut to your specification. If you’re using coil racks in your plant, or while being shipped you need to use our coil rack protection. Not only will our rubber mats protect your coils but protect your racks. Our protective mats can easily be custom cut to your specifications. Creating your mold is very costly. Tooling represents the majority of the costs. Don’t take any risks with your mold. Use our mold pads to store your expensive molds. These mold pads work in the same fashion as tool box liners. They can be cut to size and provide a cushion between your fabricated mold and your shelf or floor. Don’t risk scratches or other damage to your parts.